Cave in Brixham - Behind Dolphin Court Apartments on Overgang? Hello fellow oooo-arrrr'ers.....I've been told by a client (in my officially type role as a geologist person) that there was a cave entrance in an old quarry face in Brixham off Overgang, immediately opposite the Yacht Club. It was situated in the rock face behind Dolphin Court Apartments, apparently. I'm struggling to find any record that links up with it, but I've been told members of PGC used to go in it every year. I'm hoping if anyone has any info about it they can point me in the right direction, or send pictures. There has been a huge rockfall off the face (thank our recent Storm Imogen for that) and I'd like to know of the entrance has been blocked by rockfall, and fi the cave is still accessible to geotechnical inspection. I'd be most grateful for any info/ideas anyone has. Thanks in advance! 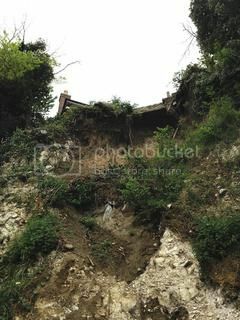 Re: Cave in Brixham - Behind Dolphin Court Apartments on Overgang? This is Coleman's Maze discovered in 1968. Nice little cave. Access is a bit tricky and best contact DSS members to get in there. Please, if you visit, leave it as you find it. Just realised it's you Paula. PM me for more detailed info. I fancy a visit again sometime if you are interested. I am free mid week being a retiree. Partly retired sir? Surely you are far tooo young for that! Sadly, access to the cave is not possible at this point. I'd love to go in but there has been a fairly sizeable cliff failure and it is very unsafe at the moment. I've been advising in my professional capacity to try to find a way forward in stabilising the cliff, and am keen any ideas we have are considerate of maintaining the access to the cave, but we are a long way away from that. that is a link to a little info on the failure. It is a difficult situation for the residents, as you can imagine. Bernard Page has offered to send a survey when he is home. I'll post a couple of pics for reference. I think the entrance is still there, but perilous at the moment. Here is a view of the face as it appeared just after the failure. There has been a bit more movement and a lot of drying with dilated fractures and loose blocks evident on my visit today. The site is now fenced off for safety. I'll keep folks posted as I know more. It looks like the buildings above may also be falling down too? The entrance is right in the corner to the left of the flats facing them with the Yacht club at your back. The fall looks as though it is to the right of the entrance which starts as a descending rift running parallell to the cliff and away from the collapse. I have a fair number of photos as there is 200 m of cave in there with nice formations as well. I gave DSS a photo I took there a few years back. One of the issues with access was an eccentric occupant of the flats who used to bellow at any cavers visiting the cave. We went over the garages to the left but since he went I gather that nobody has objected to a more direct route up beside the flats. It would be very sad to lose the cave and I expect members of the Brixham Natural History Society would feel the same as they apparently originally explored it in the late 60's which is probably when the flats were built. It should be possible to stabilise the face and actually improve access to the cave! Remember we have a caver in the planning department for Devon! I have had a look on Google Earth and compared it with the photos in the papers and if the collapse is confined to area in the photo the cave is well to the left of that right in the corner. Cave hunts during a holiday in Brixham, South Devon. I had scratched together a ‘possible caves’ list a couple of days before our Brixham caravan site holiday and on arrival day Saturday, 18 August I spoke to a member of the Brixham Yacht Club about possibly using their changing rooms before popping into Coleman's Maze Cave (GR SX94723/56589) that was opposite in some cliffs according to my GPS. On this Saturday I thought I had briefly located the cave following the advice in the updated Concise Caves of Devon (CCOD). However, I also knew this overgrown cave was “rarely visited” but not without interest and looking at the chest high brambles and nettles I knew I would need some secateurs. So up at 0830 on the Sunday and off to the nearest garden centre in Paignton to buy some. This was achieved and it was back to the two-hour parking bay up past the yacht club round the sharp hairpin bend and a walk back down the road with our caving kit to the yacht club to change, which both of us were rather apprehensive about. It went without a hitch, albeit it we received some strange ‘looks’ and we changed into our woolly bears and left our wellies and oversuits outside. Leaving our change out kit in the club changing room (Thanks to Ron the member we had spoken to). Over the road, climb up by the garage roof through some nettles and brambles wielding my new cutters I found various small solution holes but none remotely body sized. The description must be wrong and the grid reference in CCOD! But my persistence paid off, the access description is wrong in the later update, although I could and eventually did find the cave entrance by this route, my hands were scratched ribbons and I was well stung by nettles. While Sue was waiting patiently in her caving kit, I ranted and raved but eventually found the entrance. The easier route is as follows: find somewhere to park around the hairpin bend, ask very politely at the yacht club, do not lean on their white steps or take any dirty kit into their changing rooms. Go out of the club down the steps and go directly across the road under the Dolphin Court flats where there are various resident parking spaces in their car park and you will find a dustbin for flat number 6 on your right and a small rocky flower garden in front of you. Go to the right of the little flower garden, taking care not to step on it, behind the bins and up the overgrown path up to the cliff aiming up and slightly to your left. Behind the hanging ivy and creepers you will find a narrow path along the cliff face that takes you the 30 feet to the cave entrance, that is an obvious slot. It is slightly tricky to get in to, I went in feet first successfully and then off into a crawl takes you into the reasonable sized Main Chamber. This cave has bat roosts. The quarry face belongs to Torbay Borough Council and they don't know about the cave, it is recommended that we try to keep it this way. These are all holiday flats now, so just be polite if you see anyone (Note: The grumpy man who used to live in the top flat is not a resident any more). Updated Formal Cave Description: The entrance is an awkward horizontal slot which, after a short squeeze, drops into a 15 foot high phreatic rift, a crawl continuing at floor level leads to the Main Chamber (PHOTO 1). Soon after entering the main rift a climb in the roof leads to the Upper Series. A short crawl leads off a roof level. A small chamber at the end of the crawl has three ways on. The Right-Hand Route passes some very attractive red stalactites. There is another crawl called Curtain Passage, with a muddy squeeze on the right. This contains some very attractive curtains and ends in a choke, through which Dry Chamber and the base of the previously mentioned squeeze can be gained. A hole in the floor of main chamber on the right has a slight squeeze down into a Lower Series to a Three Way Junction. From the Three Way Junction, straight ahead is a tight squeeze into Boulder Chamber (to tight for me) although Sue got through okay into the largest chamber in the cave. It is 25 foot long, 15 foot wide and 6 feet high with some fine stalagmites. At the far end of a steeply descending rift, The Pot, leads to a drafting boulder choke. The crawl under the squeeze leads back to the crawl from the entrance rift. At the end of Main Chamber (PHOTO 2) on the right, forward leads up slightly to a dig and to the right is a tight squeeze section (we did not get past this) leading to a chamber and a descending parallel rift section. To the left is a cul-de-sac which leads past some formations (PHOTO 3) and a dry crystal pool, aragonite crystals and on through to a chimney section with some nice flowstone and this is also a bat roosting area. Overall this is an interesting cave and quite pretty and places, ‘bag it’, but do it discreetly. I've been advising in my professional capacity to try to find a way forward in stabilising the cliff, and am keen any ideas we have are considerate of maintaining the access to the cave, but we are a long way away from that. Hey folks, there is good and bad news....the good news is that insurance is supporting the removal of overburden at the toe of the cliff to allow more thorough inspection and final stabilisation design. The bad news is that it may be impossible to render the cliff safe for the affected structures (both above and below) without closing the cave. This will obviously require consultation with an ecologist and approval through planning, so we are a ways off an actual solution, all of which is dependent upon the finances being in place to do anything. The residents continue to be motivated to move forward with a resolution, but the wheels, sadly, turn very slowly. I can confirm the cave is not, indeed, in the sea, and the entrance is slightly more amenable since the rockfall, that is if you don't mind taking your life into your own hands. We still have not been given permission to enter the cave for H&S purposes, and are hoping to do so....and I'm really hoping I'm now able to as well! Will try to keep folks posted on this now that I'm back to work. Surely a design can be found which retains access? NB:- Holes is my job. The cave contains bats. Block the entrance at your peril. If you do this there is the potential fine of £500 per bat. You obviously misunderstood my post! Clearly any stabilisation options will need to be considerate of the cave and its potential inhabitants. I'm not in the business of sealing up caves, and clearly an ecologist would need to be involved in assessing the risks to any vertebrates or invertebrates that would be at risk from such proposals. Alternately we can let nature take its course and when the buildings all fall down around it, the cave will be sealed up naturally....but that isn't in anyone's best interest. Yesterday I undertook a detailed visual inspection of the face by roped access. The cave is clearly not in a safe condition to enter and any ecological assessment will require significant mitigation measures to even make the entrance safe for anyone to enter. I cannot overstate the hazardous condition of this cliff face. Given that the council / HSE have condemned both the top and bottom properties bounding the face, that is evident. Hopefully we will be able to put forward an indicative design for stabilisation works in the near future, which only then can begin the process of assessing the other issues, of which there are many. Quite possibly the only access will be for the little flyers...not peoples...but I cannot speculate at this point. I can only say that stabilising this feature will likely represent very significant costs that may exceed the insurance authorisations, and as such any design proposals may be turned down. Bats and cavers are much lower on the list of concerns at this point, but will get a chance to be counted at some point when we are a bit further ahead. As with all things, when it is insurance or solicitors calling the shots, these things move very very slowly. I can confirm that the entrance is even more accessible than it once was, but the risk of death from falling rock is pretty high, so no one is entering the cave any time soon. Would it be possible to give it the Baker's Pit treatment. I.E. concrete pipe access? I am sure cavers would help fund the access. It is one of the more attractive Devon Caves and had potential for extension. We are just working on a solution now which largely involves bolting of the rock face to stabilise it. We have been looking at ways to bolt away from the cave entrance to preserve it, but that is a design detail and we still aren't there at this stage (trust me, nothing is a done deal and the last thing we actually want is to close the cave, but that isn't how the insurance company sees it, they just want the house not to fall down). I undertook an abseil inspection a few weeks ago, and the cave is in no immediate peril. However, there are several layers of rock blocks parallel to the face that are at peril of toppling. It is by far the most complex engineering effort we have worked on in terms of removing the existing structure on top of the cliff to be able to start tackling the stabilisation, so costs keep going up as we look at the health and safety aspects. I will let folks know when we have an agreed design because we want the insurance and residents to include cavers as stakeholders in the final proposals. I've had a request from my boss for a survey of the cave. Anyone have one available? We intend to georeference it to the cliff for design purposes....so this is very good news indeed! It was originally explored by Brixham Natural History Society so I would start there! OK folks, the good news, my boss just finished the stabilisation designs and submitted them. The cave entrance will not be affected by the stabilisation works that we have proposed. However, the party representing the house at the top of the cliff has retained another consulting geologist to design works to restore their patio. I believe there is a piling recommendation which will be sympathetic to our bolting stabilisation or vice/versa. 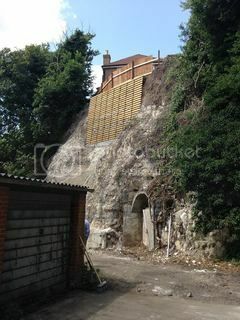 The patio and piling is being undertaken by John Grimes Partnership, and I believe they are looking to undertake a laser scan of the cave as part of their works. I will contact the project lead there and see if I can find out if that is, in fact, going to be undertaken, and if a copy of it can be made public. No promises, but worth asking. We don't have a time frame for the actual contractor works at this stage, but I'm hopeful that the cave will once again be accessible following completion of the works. Again, no promises, but it is indeed my hope. The landowners may have a different view, however. I'll try to post more when I do know. Just as an aside, as a youth, half a century ago, I remember descending the cliff on the south side of Berry Head and traversing the limestone slabs at half height to a point probably due south of the trig point. I found a rift, floored with calcite crystals, which I explored for a few feet. Does it do anywhere? Thanks for the update and all your hard work. If anyone can kepp access for cavers it you. NGR needed. There are numerous caves in this area. There is even a book on it! The best book is Chris Proctor's Atlas of Berry Head Caves publsihed in 1987. I would need a better description to identify your cave but suspect it is Grotty Hole No. I. There are several rift caves in the quarry itself and underwater plus some caves further round towards Durl Head both above and below sea level. Thanks for your replies. I can't be more accurate regarding the location as it's a loooong time ago but I'll try to find the place on my next visit. another update - apologies I haven't been able to follow much on the stabilisation works as I've been working abroad the past few months, but my colleagues have updated me today. The stabilisation works are nearly completed. We've had positive support from the ecologist as there were roosting bats that have remained undisturbed throughout the works (hooray!). The entrance has been preserved. I will be approaching the owners when work is complete to discuss regaining access for sport cavers and finding a way forward for permissions. They may be a bit nervous given the huge amount of money spent on the stabilisation but I do hope to win them round so we can continue to enjoy this little beauty. We are hoping works will be completed and the contractor off site in a couple weeks time. There may still be closures when reinstatement works for the top property commence, but as we are not representing that client, unfortunately I don't have any information on their intended works. So far so good. We keep a cave and it is safer than before! Fingers crossed we still get to go in it! If you do then the access arrangement will be improved as it was always a bit vague! It is a very well preserved cave with some nice formations in it and possible potential for extension.